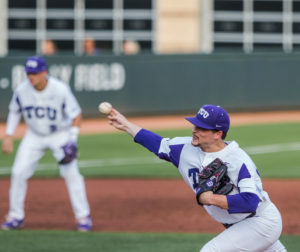 TCU baseball has focused on three simple aspects of the game over the past couple weeks: pitching, defense and timely hitting. These three elements have propelled the young team to a new level at the perfect time of the season head coach Jim Schlossnagle said. Following the sweep at Baylor on Apr. 22, the Horned Frogs were at a low, sitting at 19-17 with postseason chances looking slim to none. To make matters worse, the team lost their ace in Jared Janczak and most explosive hitter in Luken Baker for the season. Janczak recently had surgery to repair Thoracic Outlet Syndrome while Baker fractured his left fibula and tore a ligament in his left ankle. Since then, Schlossnagle’s squad has exploded for eight wins in their last nine ballgames. In the midst of their current five-game win streak, pitching and defense hit an all-time high for any Schlossnagle-lead team in Fort Worth. The Horned Frogs pitched 42.2 scoreless innings, the longest such streak under the head coach. Two starters who exploded during the win streak are sophomores Haylen Green and Jake Eissler. Coming out of the bullpen, sophomore reliever Cal Coughlin earned the first two saves of his career over the weekend. He attributed the team’s current success to their confidence. Coughlin concurred with Lodolo and said that each team member has begun to do their job and take accountability for themselves. While the win streak is exciting at the moment, Schlossnagle understands there is still a lot of baseball to be played this season. The Horned Frogs will look to keep their win streak alive this weekend as they host West Virginia for a three-game series at Lupton Stadium. The series will begin Friday night at 6:30 p.m. Following a series victory over West Virginia to conclude the home portion of their schedule, the Horned Frogs will play their final four games away from Lupton Stadium. TCU will travel to face Stephen F. Austin Tuesday night with first pitch scheduled for 6:30 p.m.